Betty Patricia Margaret Harris (No.5 in the list of female British team members) was born in Ealing, London, in 1932. Her father was a silversmith and when she was just 5 years old her family upped and moved to Birmingham, where her father continued to ply his trade. Although she was registered "Betty" at birth, her name should have been recorded as "Beth", after her mother, Elizabeth. Despite this, it would be her second name, Patricia, or Pat, that she would use and be more commonly known to the skating world. After leaving school she worked in Birmingham as a telegrapher and on occasions went along with friends to the Birmingham Embassy Rollerdrome for the general skating sessions. At first she wasn't too keen on skating and so her visits there were few and far between. However, by the time she was 18 she found that she was quite good at skating and her trips to the rink became more frequent. 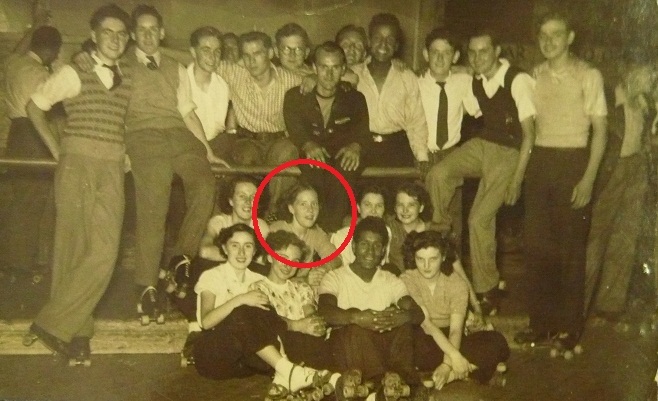 Very soon after she joined the local speed club, Birmingham, and registered herself as a member of the National Skating Association. 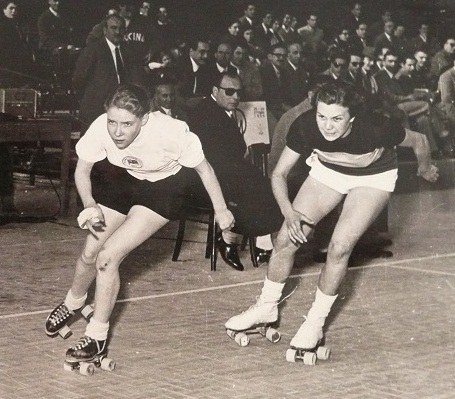 In 1953, aged just 21, she was selected to travel as a reserve skater to the World Championships in Venice-Lido, Italy. Although she did not compete, it gave her a taste for international competition and on returning home made sure that her name was on the team sheet the following year. The 1954 World Championships were in Bari, Italy on the track. Pat would tell you herself that she would prefer to skate on the track as opposed to the road any day of the week. In Bari she was alongside team mates Joan Rawlings (who would get 3rd in the 10000 metres) and Pat Kirkham. Although no individual medal for Pat, her performances were still something to be noted with 4th, 5th and 7th. Despite these results a British title still eluded her. By 1955 she was starting to strike up a relationship with fellow Birmingham skater, Leo Eason. There were no World Championships this year but Pat still got herself noticed by taking two silver medals in the British Championships, her first individual medals in these competitions. Towards the end of the year, though, at the start of the 1955/56 domestic season, Pat got the victory she had worked so hard for when on 3rd December on her home track, the Birmingham Embassy, she won the Ladies Half Mile Championship. By February 1956 she had also helped the Birmingham ladies secure the Inter-Club Relay Championship. Also in 1956 Pat and Leo married. As a bonus to the happy couple the World Championships that year were in Barcelona, Spain and both would get selected to represent Great Britain. Some people said that it was "their honeymoon", and whilst that may well have been the case, neither of them shirked their responsibilities when it came to the racing. Just prior to the World Championships Pat had secured her second British title (the Quarter Mile at Herne Bay) and also been part of the Birmingham team that won the Chambers Trophy Club Championship that year too. Pat was in good form and her inclusion into the 1956 British team was no surprise and was, in fact, the only British lady skater to get selected. During those Championships Pat did not disappoint. She would bring home with her medals from each of the three events she competed in - bronze in the 500 metres, bronze in the 5000 metres and silver in the 10000 metres. A remarkable achievement and the first (and to date, only) British female skater to bring home more than two medals from single World Championships. For her efforts Pat was awarded the "Vandervell Trophy" - a prestigious award granted by the National Skating Association who in the opinion of the NSA Council has given the best performance of the year in any skating discipline on either ice or rollers. In 1957 she repeated her wins in the British Championships, again taking both the Quarter and Half Mile titles. With Britain not selecting a team for the 1957 World Championships, Pat's next crack at a title was 1958 in Finale Ligure, Italy. This time it was on the road and although she was consistently in the top ten, her highest placing would be 8th. Back home also saw the emergence of a contender to her domestic crown when in March that year Chloe Ronaldson won the ladies Quarter Mile Championship with Pat winning the Half Mile. In 1959 the results were the same and Pat realised that she now had some stiff opposition as Ronaldson, 6 years her junior, began to make a name for herself. After 1958 Pat did not fare much better on the "dreaded" road in Wetteren, Belgium in 1960. These Championships were marred by poor judging decisions, one of which saw her husband, Leo, get declassified to last place after apparently winning the 5000 metres title, which resulted in the British team being withdrawn from any further participation. At that point in time, Pat had already raced two out of three events, again 8th being her highest placing. The continued protest by the British governing body meant that Pat also missed out on two further title shots in 1961 with the boycotting of the Voltrega (Italy) and Gujan Mestras (France) World Championships. Later that year she would travel to New Zealand with husband, Leo, and take part in a number of exhibition races at the special invitation of the New Zealand skating federation. In 1962, however, some normality resumed and Pat once more found herself in the British team. In the 500 metres knock-out the British ladies had all three skaters finish in the top five. Pat, herself, was 5th. Shortly after, fate was to play a cruel part in Pat's skating career. Pat was actually born crippled, and it was only through tortuous therapy and conditioning that she finally began to walk. Her efforts as a child were not without their consequences and often Pat would find herself not in the best of health. Over the next four years her poor health would plague her and opportunities to skate for Great Britain would go begging. Between 1963 and 1966 she would still win the occasional British title and occasional medal, but these gargantuan efforts came at a cost of her place on the British team. In fact, her victory in the Quarter Mile Championship on Herne Bay rink in 1965 would be her last British title. By 1967, however, she had recovered enough to prove once more to the selectors that she was ready for international competition once more. In September that year the very first European Championships (not held in conjunction with the World Championships) were held in Inzell, Germany. The track was a fast 400 metres flat track, and it suited Pat down to the ground. In the three events she would finish 2nd in the 500 metres, 4th in the 3000 metres and 5th in the 5000 metres. She was back - and enjoying every minute of it. The World Championships that year were in Barcelona, Spain, and once more on the track. Again her results would make people sit up and take note. She was now 35 years old and whereas many people had written her off back in 1962 she came back and won yet another bronze medal in a major Championships, the 500 metres. To round off the Championships Pat and team mate Pat Barnett, went on to take the gold medal in the relay for Great Britain as well. The World Championships in 1968 would be a milestone in Pat's skating career, for two reasons. It would be the last time her husband and former World Champion, Leo Eason, would compete in a British shirt and it would be the last time she too stepped onto a track to take part in a World Championships. Her highest position was again 8th, but for the first time it appeared that the world had moved on a stage. It was some 12 years now since she first wore a GB shirt and with Britain not sending any ladies to Argentina for the 1969 World Championships, Pat's international career was in doubt. There were no Championships of any sort in 1970 or 1972, and she would be overlooked for the European Championships of 1971 in Wetteren, Belgium. Despite these setbacks, Pat was still not ready to retire. In 1973 she again got herself selected to represent Britain at the European Championships in Grenoble, France. The track, like Inzell, was a 400 metres smooth concrete flat track, and like Inzell, Pat loved it. For some reason, 8th place would be a favourite with Pat - 8th in the 500 metres time trial, 8th in the 500 metres knock-out but then remarkably, now aged 41, she managed a bronze medal in the 5000 metres, proving once again that she should never be under-estimated and was duly selected once again, in 1974, for the European Championships in San Benedetto del Tronto, Italy. Whilst not her last time out for Britain it was the last time she would consider herself competitive. Her return to a major international competition would not materialise for another 5 years. Between 1975 and 1979 a new generation of skaters were appearing. Pat, herself, was still competing domestically with some degree of success. But by now, she had come to realise that she was not the skater she once was. Alongside Leo she was now coaching local youngsters, who themselves were knocking on the door of international status, thanks in no small part to her help and advice. The 1979 European Championships were to be held in Ostende, Belgium, close enough to be considered "local" by many British skaters. Britain decided that it was going to send a large team, in fact the largest team it had ever assembled for a major competition. Amongst those selected was Pat Harris-Eason. Now aged 47, Pat once more took to the track. The sport really had moved on since her last time out. Plastic and wooden wheels had been replaced by urethane and a new breed of skater was starting to emerge. Still plagued by injury, it was taking longer now for Pat to heal. Her last time out for Great Britain was to go largely unnoticed, competing against skaters who were not even born when she first donned a British shirt. Pat knew that the following year the European Championships would be on home soil for the first time since 1938 and desperately wanted to be part of it, but her competitive edge was but all now gone and she knew it was finally time to call it a day. There was some small consolation in 1980 when Leo was asked to be national team manager, coupled with the fact that John Downing, one of the local lads she had been supporting, was also selected. On 3rd March 1980 at Granby Halls, Leicester, Pat Harris-Eason called time on her illustrious career. She continued to support the sport alongside her husband, either by the donation of trophies, judging domestic events or simply sitting around the track lending advice. These days, ill health prevents Pat from getting around as much as she would like and now spends most of her time at home - reflecting on a career that took her to the other side of the world and rewarded her with medals and awards that very few others in British roller speed skating can even come close to matching. Since she first put on the British shirt in 1954 she will always be looked upon as a British Skating Legend.